Race day… A morning spin in the Feedback tent. The usual breakfast. I sat in the car and watched the live stream of the previous categories on my phone as the nerves grew. It was cold. It was windy. The course was muddy but drying up as the wind blew. Normally I would have no problem eating my regular second breakfast (yes, I am a hobbit https://youtu.be/XkzvHtjnNOs) but my nerves were getting the best of me and I struggled to put down some extra calories I knew I would need in a couple hours. The venue was buzzing. The crowds were growing. The anticipation was escalating and my Dad was in attendance so I knew I had to shine. The event’s schedule for the day threw a wrench into everyone’s normal routine. With an hour of open course time directly before the call-ups of our race, the women’s field was scattered around the venue with different warm-up plans. 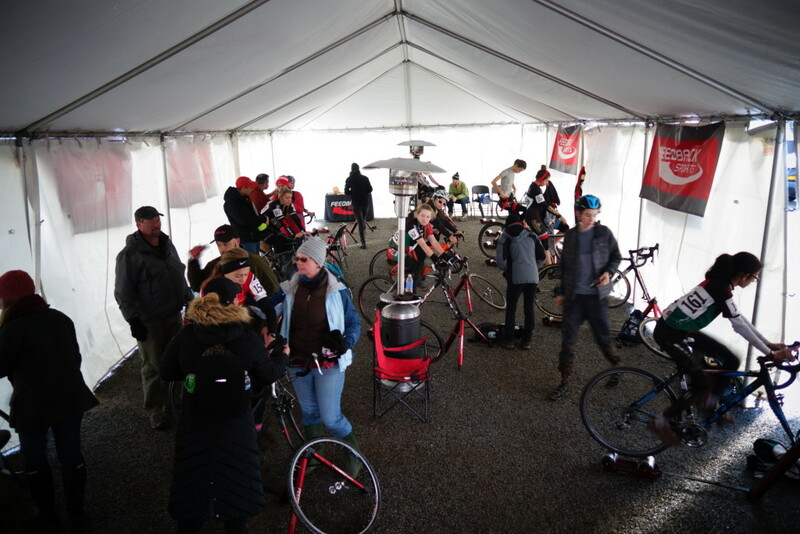 If you had peered into the Feedback Sports tent near the starting line, you would have seen a handful of women with bikes set up on the new Omnium trainers. We were ducking in and out to jump on the course for at least a lap, and upon further inspection, a majority of these women were from the west coast. Those who had to cut costs while traveling without a trainer were so lucky to have the warm Feedback tent at our disposal at Nationals. 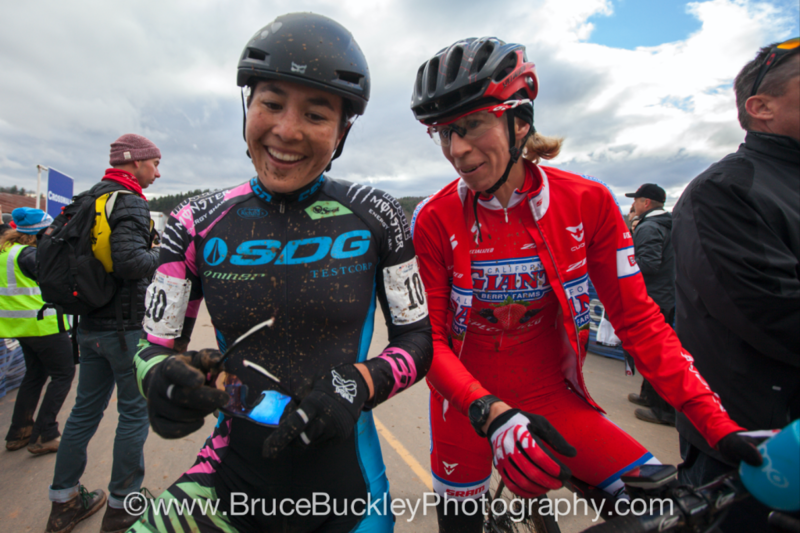 It was such a great gesture and I hope Feedback benefits from their investment in ensuring proper warm-ups were available to everyone racing in Asheville. Tenth call-up. I had the second pick on the second row after Georgia Gould (LUNA Pro Team). 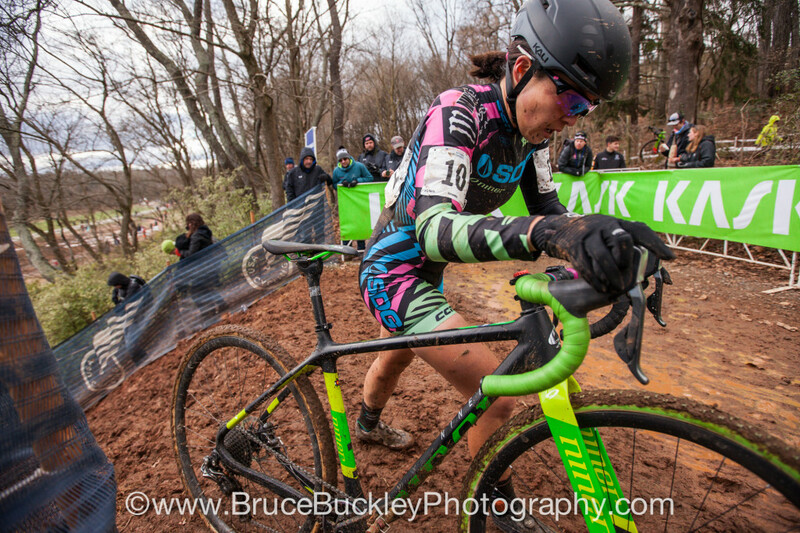 I rolled up behind Kaitie Antonneau (Cannondale Cyclocrossworld) and stood there reveling in my second row start. I think I was so excited about just being there that I was oozing extra confidence as we stripped off our jackets with two minutes till start. 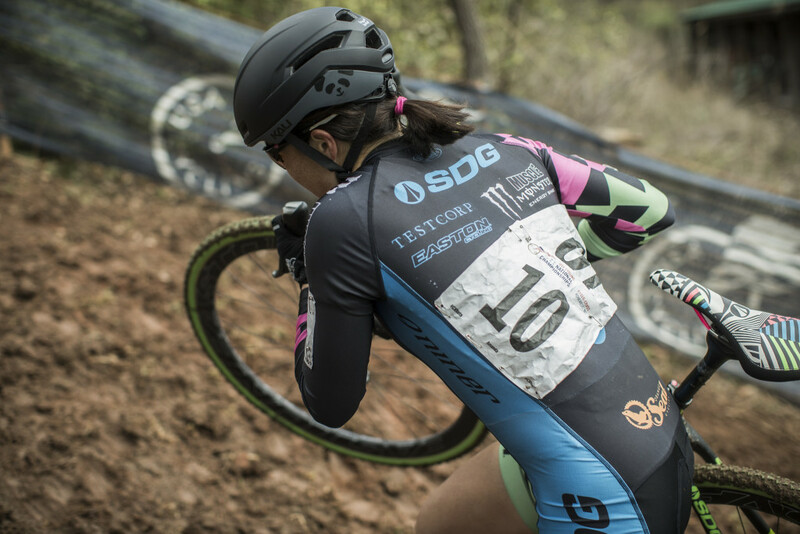 I had been in Asheville since Monday evening and spent the entire week dying to race. When I’m confident in how I’ve prepared for a race, I can’t wait for the race to happen and leave it all out there. This eagerness got the best of me on the starting line and I was off and clipped in faster than I ever have. Antonneau and Katie Compton (Trek Factory Racing) shot off in front of me but started veering left toward the center of the straightaway – lining up the first turn at the top of the stretch. As they veered toward the center, I kept moving straight ahead until I could see nothing but open road in front of me. Gould and Rachel Lloyd (California Giant Berry Farms/Specialized) started to the right of me but I somehow had half a wheel ahead of them and kept moving up. This was my favorite starting strip of the season. The grade was just slight enough to make you work a little harder than you would have had it been completely flat, and it also prevented dangerous mach-speeds from developing like in Louisville. Pictures from the start later show that Courtenay McFadden (American Classics / Zones) got the holeshot as we charged toward the first sweeping left turn on to the dirt. Compton was a wheel ahead of me to my left and as we went under the Kask flyover, I passed her on the right and moved up next to McFadden. There was a drainage ditch/double bump following the Kask flyover that made me nervous after hearing about the pileups it caused in some of the previous categories. With this looming in the back of my head after reviewing scenarios with David (Coach #stachebomb-er), I decided to charge forward and lead into this section to stay safe. It was smarter to lead the group through the bump at more perpendicular angles rather than trigger a potential 30-person off-camber mess that instigated plenty of wrecks earlier in the week. As I made my way around the next turn and over the following flyover, I was leading the race. LEADING?! I heard David yelling from the pit, “Who are you?! What are you going to do now? !” I was laughing inside because I had no idea what I was doing there. I wound up there out of pure fear because I wanted to avoid any mishaps through the first couple turns. But now I was accidentally leading a National Championship race, my mind was running ahead of me, and I knew I was not supposed to go too far above my limit at the start. I cleaned the 180 turn after pit number one and rode smooth because I didn’t want to mess up anyone behind me. Looking back I realize this was totally the wrong mindset to be in and I should have capitalized on my position way more. But in the heat of the moment I was in total shock of riding at the front and in that instant went above and beyond my expectations for my race. I mentally settled at that moment in time. I later joked that I could’ve quit right there, two minutes in to the race, and been happy. It’s true, as ridiculous as it sounds, because all I wanted was to have a race I was proud of at Nationals. And leading the race for about sixty seconds made me so proud because it was a culmination of everything I’ve worked on this season building up to that moment. I led up the first run-up and Elle Anderson (SRAM / Strava) came up on my right side and Compton on my left. Compton passed me on the next section right before the pro-only chicane that peeled off the gravel road. She did it with such conviction that I almost kissed a bush on the left side of the course and it was a friendly little kick in the gut that I needed to get racing. Game on. I really hate to admit this but I was cramping so bad on the run-ups. I never cramp and was amazed especially because it was a 40-50 minute ‘cross race. I incorporated more running into my later season training and was in shock that my legs weren’t prepared for this amount of elevation change. That was my biggest disappointment with the day. Unfortunately, I spent the better part of Monday through Wednesday fending off a looming cold that kept itching the back of my throat. I successfully warded it completely off by Friday, but part of me still wonders how much that affected me later in the week. Regardless, all I could do at that point was put my head down and get one foot ahead of the other as quickly as physically possible. 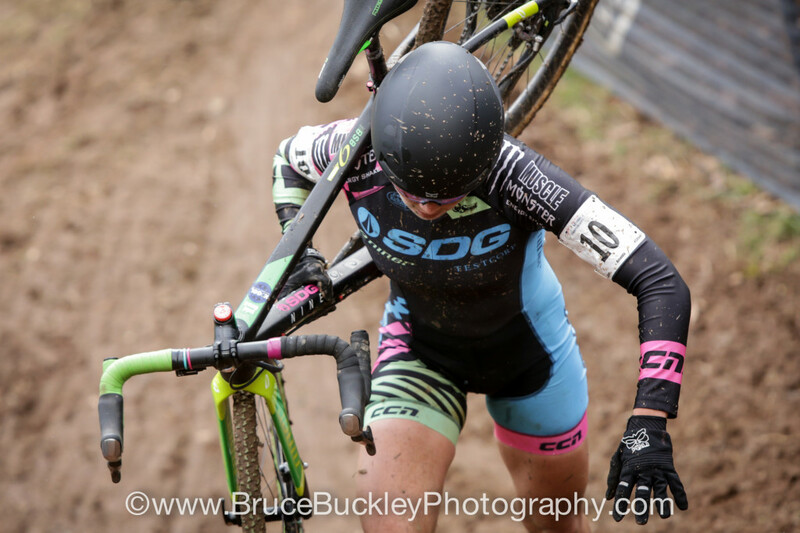 Around a few turns towards the end I could see Meredith Miller (Noosa Pro Cyclocross) and Amanda Miller (Boulder Cycle Sport/ YogaGlo) just dangling behind me and all I needed to do on the last lap was not make any mistakes that would give up my spot. As elegant as we may have looked in photographs, you can be assured we were all suffering. That course, amazing as it was, was a fierce test of fitness and skills. Over the barriers one last time, around the final corner, and there was Richard Fries to welcome me through in seventh place. I waved to the crowd and finished with a giant grin. I shook Fahringer’s hand and congratulated her for a fantastic finish. That was a great way to cap off a season for the Amy D. Foundation and she proved for the second year in a row that if you give a promising female talent pro-level support, she will flourish. Everyone involved in that program has to be thrilled with two years of success under that framework. 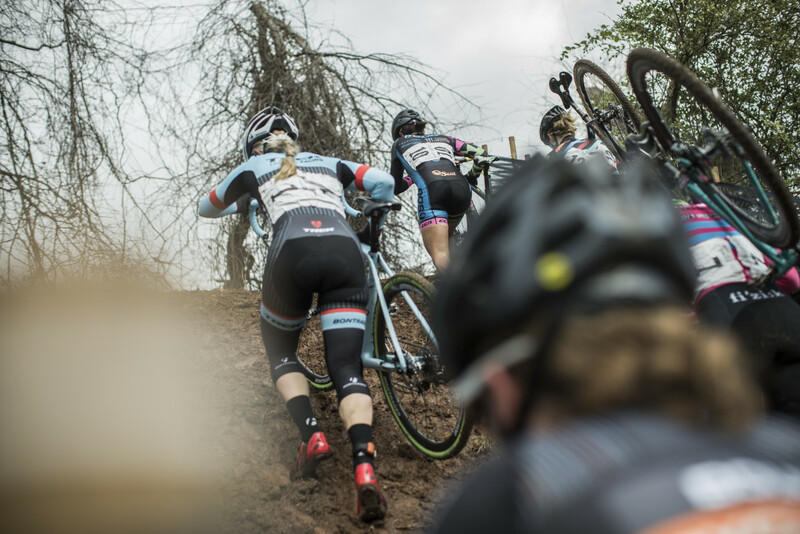 And the rest of us women racing have to be eager to congratulate it and remind others how more support for women can produce a stronger American contingent in the future. Rachel Lloyd said a few words to me at the finish line that made me start tearing up. She is one of my favorite female racers and I have so much respect for her as a badass mother. 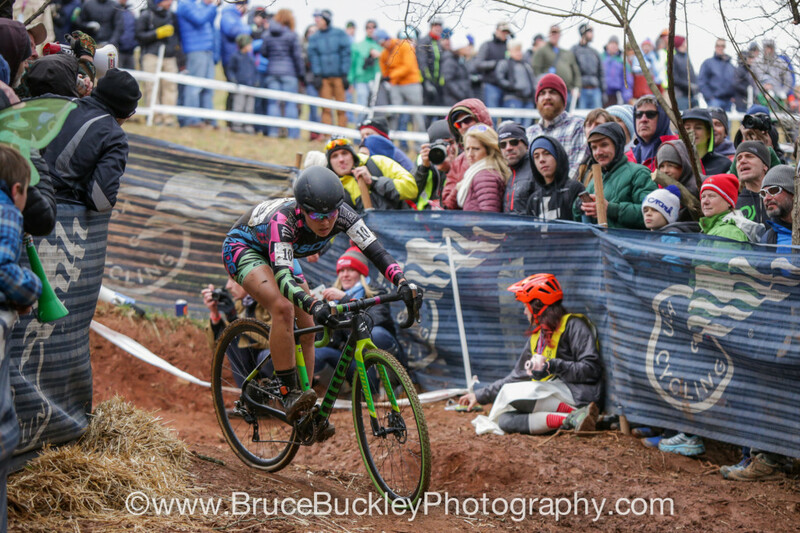 I was honored to have been up there with her even if just for a couple laps as she made her way around what would likely be her last elite National Championships. Dorothy “Dot” Wong was also at the finish line and seeing as I have to credit a lot of my accomplishments to her work as a promoter in southern California, it was nice to see her and give her a hug. 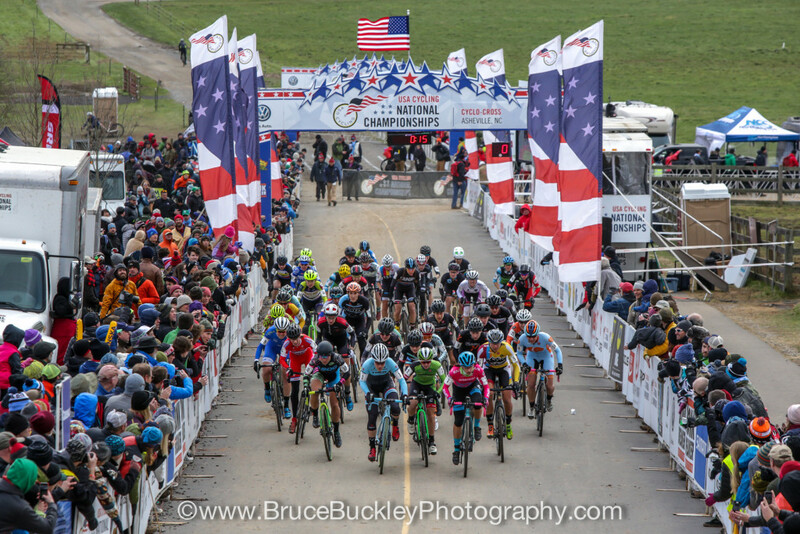 Bill Schieken, the face behind CXhairs, was just the man I wanted to fist-bump as I exited the finish-line chaos. There have been far too many people who have thanked me for my write-ups or told me how much they enjoyed reading them this season and it wouldn’t have been possible without the selfless work Bill pours into the site. It’s nice to be able to say thank-you with a ride like that. I went back to the car and called my dad because I couldn’t find him at the finish line. He had an evening flight out of Charlotte that he had to catch, so he needed to leave right after my race. Along with my mom, my dad runs the family business that I work for and also works part-time for American Airlines as a pilot. He’s got a rich history as an airplane and helicopter pilot, and this particular week had him stationed in North Carolina. As luck would have it, he was able to get a rental car and drive over to Asheville to watch my race on Sunday before flying back home that evening. I’m extremely lucky to have parents that have always been supportive of my athletic endeavors and I was so proud to have raced that well while he was running around the course cheering for me and my mom was on the other side of the country yelling at the computer screen. A few snowflakes were starting to fall. I rolled back over to the Feedback tent to warm down. I opened my phone and became overwhelmed with the messages that poured in. I sat there slowly spinning as emotions swept over me and I couldn’t help but cry happy tears. Not every race goes according to plan and more often than not we learn to cope with disappointment more than joy in bike racing. In that moment I was happy. Happy I had exceeded my expectations. Happy I grabbed extra UCI points. Happy I had my best Nationals finish ever. Happy my dad was there. Happy I could present this to sponsors. Happy I made the fundraising dollars from my family, friends, and SoCal Cross worthwhile. Happy I could now focus on imminent travel to Europe.